Enjoy the sounds of the Rat Pack on the steps of Borough Hall! A special appearance by Peter Scott Ruben from 6-9 pm on the steps of Borough Hall. Also, The Cow and The Curd will be visiting us again! They just won ‘Best Food Truck in ‘Best of Philly,’ so don’t miss out on these awesome curds! Join us for our back-to-school community block party featuring local organizations that can help your child after school! 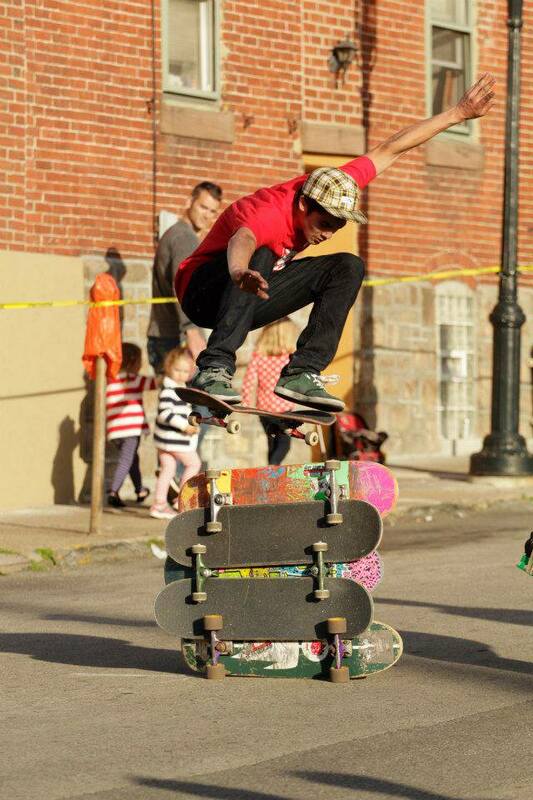 Don’t miss the Ambler Skate Shop skate demonstration, next to the shop, on North Spring Garden! Stop in the shop and get a peek at the soon to arrive limited edition shop board, designed by Mike! Ambler Music Academy will have instruments and tons of info about their lessons, classes, and recitals. If your little one already plays, have them bring their instrument and play for us! Best Kept Secret Salon will be doing temporary hair paint for the kids and a raffle for the parents in the Kids Zone. The Cow and The Curd brings Midwest Wisconsin cheese flavor to Ambler! Featured on the Food Network’s The Best Thing I Ever Ate and recent winner of “Best Food Truck” in Philly Mag! Sweet Briar Cafe is celebrating First Friday with NEW Ice Cream FLAVORS! Pumpkin! Peanut Butter Banana Chip! And…Teaberry! The featured shake for first friday is PUMPKIN, although they can make a shake or sundae out of any of 26 flavors♥ Check out our family-friendly menu for tonight before or after strolling around town. Bar 31~ Live acoustic jams. With Matt Chicetti from 6-10pm. $5 Atwater Vanilla Java Porter and Bruxelles du Blanche Wit. Visit FROX, get your great fall looks and enjoy some lite bites and cocktails, during First Friday! Visit Tattoo Galaxy: To Teach is to Touch a Life Forever! To all of the wonderful teachers out there, Tattoo Galaxy is offering 20% off at our Ambler studio during the First Friday event this Friday, September 6th. This includes appointments that are scheduled on Friday for a future date. Sew Vintage Boutique will be offering a 1st Friday special on Sugarlips. Also 50% off sale rack outside. Mark downs on certain fall items! Get to Armario, they will be offering a First Friday promotion of 10% off new fall items, 20% to 70% off sale items! Act II Playhouse is offering 25% off all single ticket orders for our current show DIDN”T YOUR FATHER HAVE THIS TALK WITH YOU? Discount is only available in-person between 4pm and 8pm on Fri, Sept 6th.